And so she followed it…"
Dear lovers of jewels and art in general, via Jewelartgallery you have the opportunity to purchase unique modern creations by Tereza Damianidou, glyptographer, gemologist, and goldsmith. The collections can literally satisfy a wide range of ages and preferences. They are addressed to children, young people, men and women. They cover both classical and more unconventional and modern tastes. It couldn’t be any different, since this is the multifaceted character, personality, philosophy and Tereza’s look at things; sweet, dynamic, romantic, subversive. Jewel Art Gallery collections by Tereza address various techniques in silver and gold, among them: fretwork, engraving, imprinting, microsculpture in semi-precious stones, wax or metal sculpture, forging, casting forms, leather processing, plaster modeling techniques, controlled- complete oxidation. Several creations are embedded with precious stones, coated or decorated with alternative materials like silk, fabric, leather, steel wire, bronze, copper. The techniques are often improvised and result from experimenting; materials vary from abundant to hard to find, stones can be rare, while the design always represents this “aura” of freedom of a spirit refusing to compromise, following its own personal-unique path of creativity. This is what confers the special character in every piece of jewelry; its identity, its soul and value. The aim of Tereza jewelry is to satisfy those who seek that special, handmade, refined, fine jewelry, always envisioned through a “fresh”, contemporary, artistic, emotional, “open” perspective. 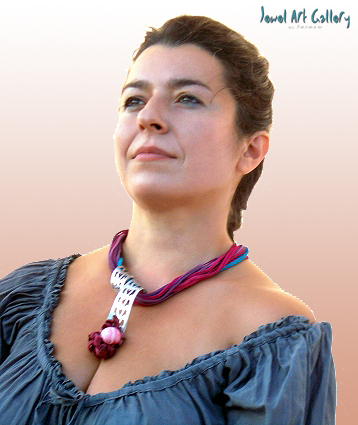 Tereza Damianidou was born in Piraeus. From 1990 to1993 she attends seminars of appraisal of antiques, old stones, organic and inorganic materials at the School of Glyptic Arts in Athens, where she is enchanted by the world of art. Subsequently she studies gemmology, glyptography and adamantology in ELKA (Greek Center of Silver-Gold Smithery) with Nick Kielty Labrinides and Alexandra Krikou. 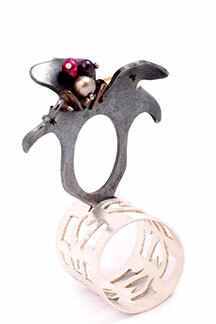 In 1996 she receives the Diploma of Gemmology from GAGTL, Great Britain. In the following years she is initiated into the world of microsculpture, design and jewelry making in “Plakas” Art Center by Manos Panagiotou. In 1999 she creates her workshop in the center of Athens, meanwhile teaching gemmology, glyptography and jewelry in her premises and in renowned schools. In 2003 she attends hot enamel treatment with Alexandra Krikou. In 2007 a seminar titled “Casting forms and colours, inside and outside” by Peter Bauhuis, Alchimia. In 2008 she gives a lecture on “Homage to Cecil Thomas and his connection to Greece”, Royal British society of Sculptors and Hellenic Centre, London. In 2011 she becomes mother for the second time. 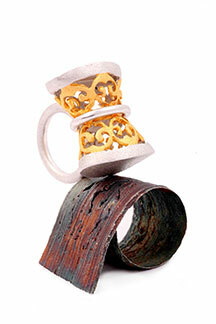 She dedicates herself to her two “cuties” and her “insulin”, as she characteristically calls modern art jewelry. She is inspired by life itself, seeking the provocation in the technique, the unexpected in expression.